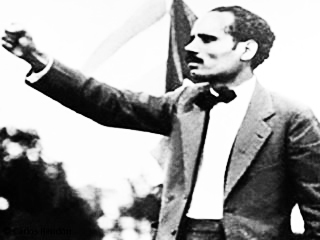 Father of Puerto Rican Nationalism, Don Pedro Albizu Campos stands out today as one of the United States and Latin America’s most prominent and outspoken advocates for social justice. While serving in the US military in WWI and receiving his law degree from Harvard, Albizu Campos, known affectionately as “El Maestro,” experienced first-hand the overt racism endemic to American society in the early twentieth century, and became convinced of the need for Puerto Rican independence from US colonial rule. After law school Albizu Campos declined several high-profile job offers in order to return to Puerto Rico and devote his immense intelligence and unrivaled oratorical skills to liberate his people. After becoming the president of the Puerto Rican Nationalist Party, Don Pedro spent the rest of his life fighting for independence and was imprisoned on several occasions in both the US and Puerto Rico, serving over 25 years in jail. While in prison in San Juan for seditious conspiracy the US government subjected Albizu Campos and other Puerto Rican prisoners to radiation experiments without their knowledge or consent, leaving him badly burned and exemplifying the US government’s callous disregard for the island and its inhabitants that Campos warned and fought against. Upon his death on April 21st, 1965 over 75,000 Puerto Ricans carried his remains to the Old San Juan Cemetery. Today several schools are named after him in both the US and Puerto Rico, and streets bearing his name are common on the island. Unfortunately Puerto Rico itself, officially an “unincorporated territory of the United States,” remains almost entirely economically dependent on the US, and Puerto Ricans are subject to US law but are not allowed to vote. Check out the trailer for the documentary “Who is Albizu Campos?” below and visit the website by clicking here. 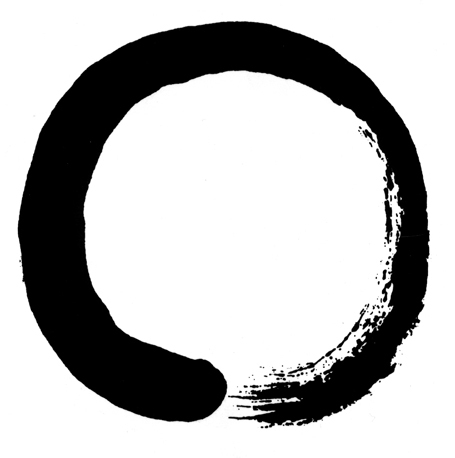 Also check out some killer quotes here. 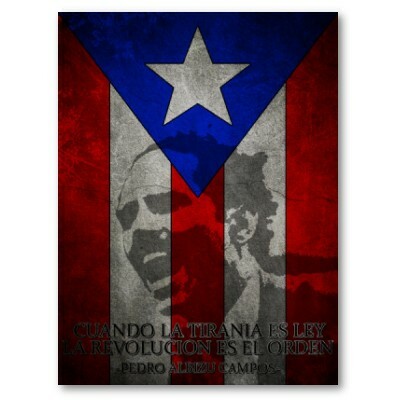 I got the sick Puerto Rican flag image from a poster for sale on zazzle.com – you can buy it and a bunch more Albizu Campos stuff here. And to top it all off listen to one of his fiery speeches after you check out the documentary trailer. Why thank you. By the way we loved the Carmen Miranda look. We’ll check back! Don Pedro Albizu Campos lives in the hearts of all those who dream of an independent and free Puerto Rico and his life and his example will always be an inspiration. TRUE. Thanks for your comment, it is much appreciated. So many Puerto Ricans – not to mention Americans – have no idea about his story. Solidaridad en la lucha contra la ignorancia y la opresión!